Italians have never failed to exceed the expectations of their customers with their high end performance sports cars. However in today’s trend, people are gravitating toward the SUV. SUV sales have been increasing substantially over the years and manufactures know this is the direction they need to move in to keep competitive. As more and more SUVs flood the market, consumer demands have become more and more stringent. Today's consumers want it all, a big SUV that’s comfortable, handles like a car, but yet can go offroad, is luxurious, practical, safe and so on. With that being said, welcome to Maserati’s answer to the market, the Levante. At first glance, it may seem like any other luxury SUV, but pop open the hood and you are greeted with a 3.0 litre twin-turbo V6 engine assembled by Ferrari that pushes out 345 horsepower and 500 Nm of torque that goes from 0-100 kmph in 5.8 seconds and has a top speed of 250 kph. If those numbers do not satisfy you, there is nothing to worry about as this is the Levante’s base option. You can always opt for the ‘Levante S’, which increases performance numbers to 424 HP, 580 Nm of torque, does 0-100 in 5.0 seconds and can reach a top speed of 263 kph. If that still seems slow, soon Maserati will be releasing the ‘Levante GTS’ which will give you 550 HP, 729 Nm of torque, does 0-100 in 4.0 seconds and has a top speed of 291 kph. Back to the base model we tested. The 3.0 V6 is mated to an 8-speed ZF transmission which delivers smooth and fast gear shifts and better fuel consumption. It offers 7 dedicated shift settings that can be selected via the normal, sport and off-road buttons next to the gear lever. You can also turn on the I.C.E. (Increased Control and Efficiency) mode for better traction in slippery conditions while also reducing fuel economy. While the standard mode is great for cruising, it feels like any other luxury SUV. There are times when you need that snarling responsiveness and raspy exhaust note though, flip the switch from normal to sport and the Levante bring out a whole new personality. It’s surprisingly aggressive for an SUV and a complete pleasure to drive. Maserati said in one of its press releases that the Levante is like “the wind that blows across the Mediterranean and can change from benign calm to gale force in an instant”, this really does ring true. Maserati have managed to capture some of the Italian passion and flare that the smaller Maserati sport saloons and coupes are known for. The exhaust note is bold when switched into sport mode, a noticeable burble even from idle can be heard. Pulling up through the gear releases a satisfying bark. Under acceleration the torque figures begin to work their magic, there is a very enjoyable pull that does push you into your seat somewhat. In the corners the levante is a very capable machine, the balance of the 4WD system is perfect for spirited driving, when pushed the rear is allowed to rotate a little which is pleasing. The Levante rides on an advanced active air suspension which gives you 5 settings to choose from depending on your driving needs. Normal mode is an absolute pleasure for daily driving where the ride is as smooth as silk and going over bumps is an effortless endeavor. Push the sport button twice and the suspension lowers and all of a sudden you are able to take sharp turns with precession. On the other end, you have the off road mode. 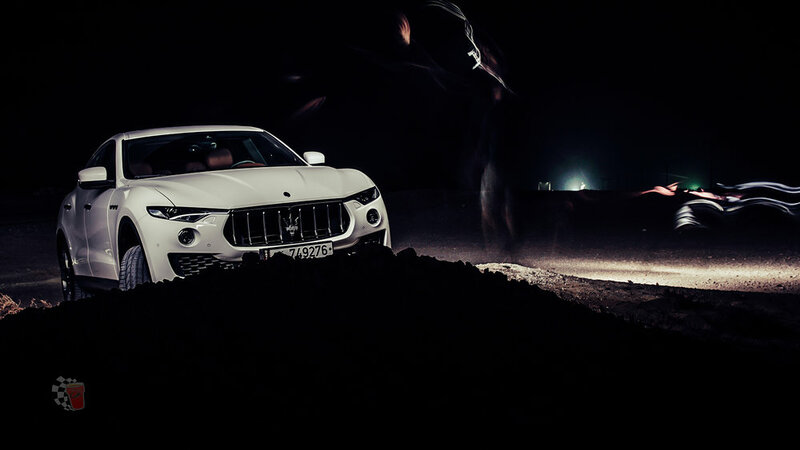 Putting the car on the highest raised setting and the Levante will give you the clearance you need to get a great off-road experience. We would advise using proper off road tires however, but the car is capable nonetheless. We have to admit, in the beginning we doubted the seats when we sat in them at the inauguration of the Levante, but after testing them for 3 days on the street, we can safely say the seats are nothing but comfortable and supportive. The 12 way power adjustable and memory seats with lumbar support hug you in the most well-appointed way possible providing the utmost luxury and comfort. There is only one place better than the exterior of the Levante and that is the interior. Not only is all that smooth soft leather visually appealing but the cabin of the Levante has all the right proportions. Everything is where it should be. All the main buttons are at your fingertips. There are almost an infinite number of controls on the front and back of the steering wheel and everything is easy to get to. The steering wheel gives you a great feel and the brushed chrome paddle shifter are perfectly placed on the steering column rather than the wheel which is a nice touch. I have to also say, a lot of manufacturers struggle to get the tactility of the paddles correct, the levante has a very satisfying and weighed click to the paddles. The 8.4 inch Maserati Touch Control Plus (MTC+) is a highly responsive interface with very few buttons which is intuitive and easy to use. To add to all this, the color combination of the interior enhances the Levante’s luxury and sporty feel. Maserati have done a great job of adding tiny emblems of their logo in various places around the cabin to remind you that you are driving a unique and luxurious Italian masterpiece. To summarise, the Levante is a great SUV. The perfect blend of luxury and sport. With an array of trims to choose from and the option to build you own Levante with tailor made specs. We can say without a doubt that whether you want it as a family car or a luxury commuter with a sporty SUV personality, the Maserati Levante will more than satisfy your needs, if not exceed them.